Arteta’s Protégé. For Whom The Bell Tolls. I love Mikel Arteta. I love him because I am not dead inside. “The diminutive Spaniard” is so talented that he made the transition from an attack-oriented midfielder to a stay-at-home, deep lying defensive guardian almost seamlessly. It is clear the deep respect Arsene holds for him. 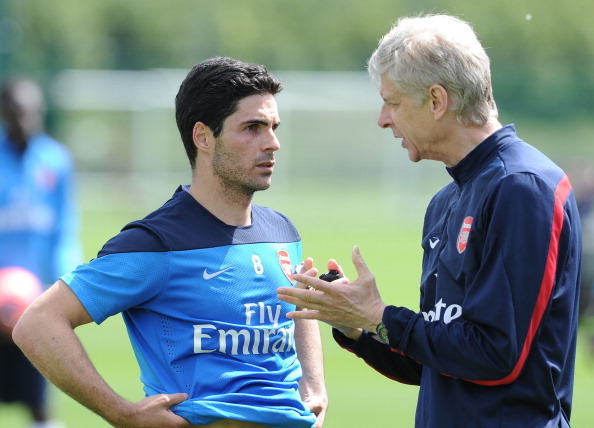 Arteta has been “Wenger-On-The-Pitch” for his time at Arsenal, translating the game plan dynamically on the field. And The Word was made flesh. Of course, outsiders never got Arteta. Invariably they would talk about how we needed someone else, someone who could win tackles. The one that told us how “unsung” poor little Michael Carrick was. 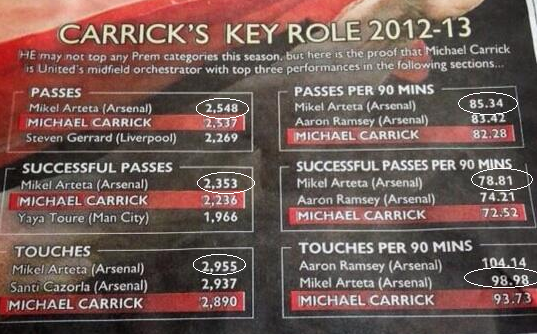 All the while ignoring Arsenal’s Mikel Arteta. Arteta wasn’t just unsung. He wasn’t even hummed. But, at some stage in the near future, Arteta’s days as a starter will be well and truly over. And he must pass the baton to his new protégé. Speaking of his protégé, we’ve been lucky and Arsene has been lucky to stumble upon and trip over an Arteta-replacement hidden in our squad. While the world has urged him to import a top talent, Wenger has resisted for whatever reasons. And through good fortune and patience he has stumbled on a newer, younger model to replace the aging Arteta. It would seem almost impossible to replace the exact mix of talents that Mikel brings to the position. Coquelin provides extra bite in the tackle, extra appetite for the interception, an imposing physical impact. 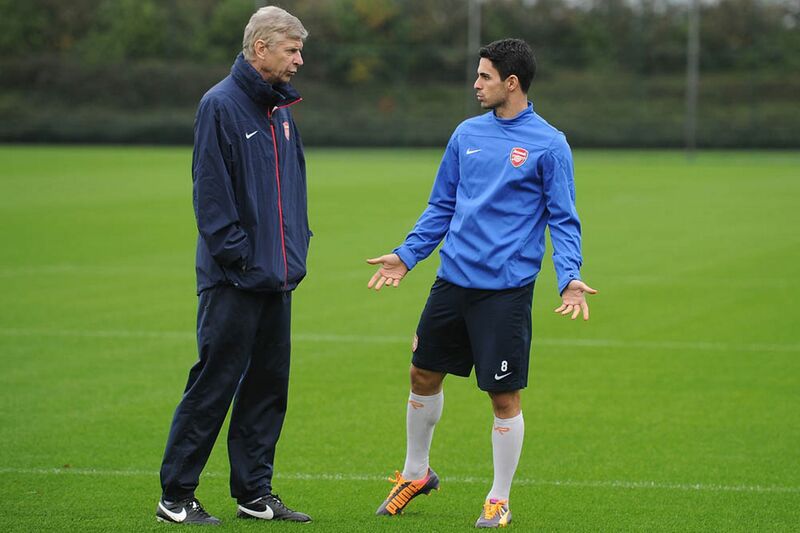 But Arteta must find ways to pass onto his true heir the calm, poise, control, faultless passing and simplicity. Allied to that is his tactical understanding, leadership, and even penalty taking. Also his Spanishness. A tough task and a long list, you might think. Ridiculous and unreasonable. How can you ask Coquelin to be that which he is not. Well, you don’t. You ask the guy standing beside him. Santi “The Protégé” Cazorla. Let’s be honest. Is there anything Cazorla can’t do? Let’s start with the big stuff. He’s already extremely Spanish and he’s absolutely adorable. At least as adorable as Mikel, and probably more Spanishy. He is a many-capped International in the era of Xavi, Iniesta, Silva and Busquets. 73 appearances in one of the all-time great National Teams, while they won the European Cup and the world Cup. He already takes our penalties. He has Wenger’s deepest respect and trust. He has a superb attitude, a never-say-die mentality. He is humble, a consummate professional, and he loves football. And did I mention he’s adorable? Like Mikel, he has perfect touch with his small, soft feet, possibly achieved through the cruel and barbarous foot-binding practice of the ancient Chinese. But well-worth it, in the end. Mikel is good with both feet. Santi only has one foot which he swaps from ankle to ankle with blinding quickness as he runs. “Santi Cazorla played over 50 games and from the start to the finish he was absolutely top. Maybe with the quality and the consistency included from start to finish, it’s Cazorla who has stood out the most. “He had a few games where he was unplayable. I do not look too much at his individual brilliance. It seems a much smaller task for Santi to become the new Arteta than for Coquelin. Cazorla simply needs time behind the wheel to resolve the last few short-comings. The tackling and intercepting stuff. But he already seems rather promising at those, in an Arteta-style intelligence-over-brawn approach, where 2 men go into a tackle but only Santi and the ball emerge. And more time in the role should allow for greater positional discipline, better decision-making combined with excellent two-footed distribution from the back, and the glorious sight of Santi pinging cross-field diagonals left and right with either leg. You might say that Santi doesn’t have the attributes required to take that step into becoming the most defensive midfielder on the pitch. But then you and I would have said the same about Arteta once. Could this be in Wenger’s thinking? That Coquelin’s backup will not be a new DM, or even a patched up Arteta? But an evolving Santi, who, given his robust fitness, will go on to be the new Arteta for the next 3-4 years? Some matches we will line up with Coq and Santi sitting deepest. Some matches we will line up with Santi and Ramsey (or Jack.) It’s how we lined up against Sunderland at the end of the season. I think that part of the formation did ok. But the team only really got into gear when Theo came on. Then we looked deadly. Could this be the thinking? I don’t know. I just type what I’m told. Great to have you back, Poz. Santi-ational post as ever. But, I expected a special article about the FA Cup triumph. Ray, I mainly blog to give an excuse for your comments. And fear not, i have an FA Cup ish one coming up next. Interesting read. I went into this thinking Wilshere or Rambo, i came out with a different perspective. Write more often Poz! Great piece. Hope Arsène is thinking that way. You get him just right. Surprised you didn’t mention that he’s adorable. Welcome back Poz, great post as always.I expect nothing less. Thanks Bee. I’m back and I’m beautiful! Always a good read, poz. 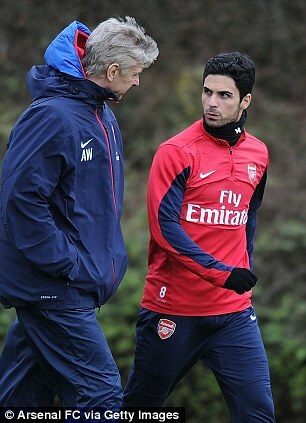 Arteta, a favourite of mine, can be on the coaching staff soon. Respected, recent players can make a big difference to the training group. And of course we all love Santi and to keep him also is essential, whatever his role. Thanks for the article. I love how Santi also made the transition to his deeper role seamlessly. What a buy he has been. He’s played all over the pitch. Cazorla’s contribution over the last 3 seasons has been nothing short of astounding. And he’s only a little fella. Arteta AND Cazorla. Arsene, you are spoiling us. You know what I think, which is a bit mad? That Oxo could be a Coq/Santi hybrid in years to come. Yeah, ok, I know. Just putting it out there. Cheers, mate. Very kind. And I like your Oxo pick. He has great bite to his play, barrell shaped, physical. Could be a terror in midfield. Thanks Mary. Lovely welcome back from you! More than anything I love to see how a brilliant and versatile player like Santi can evolve to play at a top level as he matures. He’s family now. Hope Arteta powers back and has at least 1 more great season with us. Entertaining & insightful as always. It suggests that even without Arteta playing a full role, we have five first-choice players for the two CM positions (Coq, Santi, Ramsey, Jack, Ox), or 10 combinations. Add Rosicky for good measure. With those options, the addition of Vidal or Schneiderlin seems like a low priority. Was wondering if Wenger actually wants Cazorla to become the next Arteta in a positional sense? Arteta would rarely venture forward and remained deep. It worked well for us when he played that role because he sort of played a mix-and-match between Coq and Santi like you mentioned and he didn’t really have much support. He was perfect at passing the ball out from deep; I think it’s something that’s highly underestimated and it was only apparent when Arteta would be out injured. However, Santi playing slightly deep and advancing has also worked for us. The passing the ball out from deep seems to have become Mertesacker’s role to some extent now if Santi is advanced, or Santi does it; offering us a bit more flexibility? At the moment Coquelin plays a role in helping Mertesacker play the ball out by taking players away from him; maybe even Coquelin will be trusted enough to play the ball out. In other words, we have more options now from an Arteta-role perspective. Sure Santi doesn’t have the exact defensive discipline of Arteta yet, but will he NEED to develop it? Personally I think Wenger, especially with the emergence of Coq, has tweaked his system that doesn’t quite require the Arteta-role. Doesn’t mean Arteta cannot play, only from a positional sense. Not sure if I made sense! Wonderful as always. I’ll appreciate deeply if you can write an article on the lovely work Mertesacker has put in as regards our defense and ball distribution from the back. Also Poz i think we don’t need a new striker, rather a goal scoring winger like Sanchez. All the big teams make use of those sort of player. Teams like Bayern, Barca, Madrid, even Chelsea. Rarely we find such Henrique kind of striker available. I look forward to knowing your thoughts on this. Great post. “Adorable” is the word that my wife has been using to describe Santi since he joined us. Haha. Well, its the only word for the man. Who Do I Need To Blow Around Here? Club Announces Rube Goldberg Emery. Plus Arsenal’s Coach Selection Process Exposed. Behold Excalibur. For it is mighty.